So, I recently got a new job, and because of that kind of upheaval in my usual life, I’ve been having trouble balancing everything I need to do. Because of that, my drawing has been suffering, so I’m going to take a little break to sort out my schedule and get some more pages drawn. Hopefully I won’t lose too many of you awesome readers. See you again on August 1st! The Night Surfers at Meltdown Comics! The Night Surfers at Meltdown Comics! 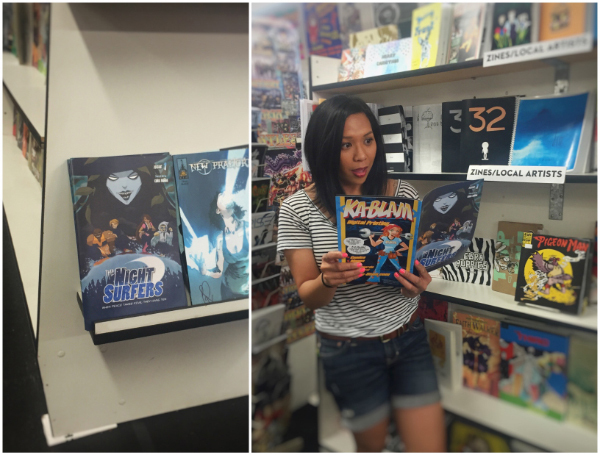 published on April 24, 2016 Read more posts by the author of The Night Surfers at Meltdown Comics!, The Night SurfersNo Comments on The Night Surfers at Meltdown Comics! Not that you guys can’t already read all of The Night Surfers here on the site, but I’m excited to announce that you can now find Issue 1 of my comic at Meltdown Comics in Los Angeles, California! My actor friend Shalimar was nice enough to model it for me, haha.